Priscilla Queen of the Medina was the host of an amazing art experience, the evening began with a photography and art exhibit from the artists in residence Cihan Cakmak and Eva. The fantastic concepts of formations and shadows prompted the biggest question of the night… What is art? A room full of Moroccan and European artist sharing work, discussing concepts and creating a high-energy atmosphere was an art experience with in itself. Pricilla’s provided that sense of belonging with in an arts community that was established just by being present at this event. 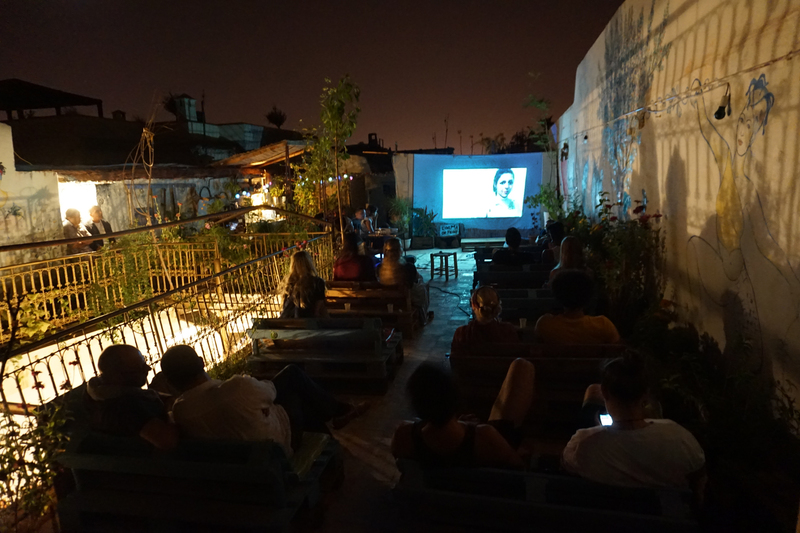 The night continued with a secret cinema vibe with a film screening of work created by German and Moroccan filmmakers. Outdoor projection under the stars and the roof terrace was an exhibition of art in its own right. The walls covered in paintings by guest who have been and gone, the recycled furniture, the fantastic food and the people that made this possible. Everything about the evening was a success and the exchange between Moroccan and European artists was truly inspiring. Priscilla Queen of the Medina is not only a place for people to stay and a creative artist space… From the moment you walk through the door, everything around you inspires creation and displays the creative mind of the owners and everyone they have opened their home to. So what is Art? Art is whatever you want it to be, it is something that provokes a reaction and change within your thoughts and feelings. This exhibition was a huge success and everyone involved radiated positivity and support for fellow artists, it was also the beginning of another creation process yet to happen. Thanks to Jodie Diaz for this nice feedback! Thanks to Hana Tefrati and Siham Alaoui for your support!